Cool. Hard. Ice. Back lit by blue LED lights under a tough polycarbonate housing to light up your nights. One LED per key lights the individual characters - and they will never rub off! Comes with a 6' USB cable with a type A plug. The 82-key Deck weighs 2 pounds and measures 12" wide x 6" deep x 1.8" high (304.88mm wide x 152.41mm x 45.72mm). 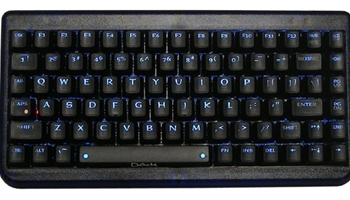 Blue, backlit keyboard available in USB only. Deck 105 key backlit keyboards also on sale. drivers and therefore does not require custom software drivers to be installed on the host computer prior to use. located just to the right of the spacebar. don’t know your current brightness level - you just want to either brighten or dim the brightness. key, then press either “0” for off, or “1” – “7” for on brightness levels. state of the “Fn” key. This device operates from +5Vdc +/- 10% and draws 248mA maximum. This device complies with FCC part 15, subpart B, class B. This device is a UL recognized component for Information Technology Equipment. No maintenance should be required. The keyboard may be occasionally cleaned using a damp, lint-free cloth. Read This Important Information Prior to Initial Usage! or tingling in your arms, wrists or hands, consult a qualified health professional.